Biometrics get a lot of mentions as “the future” of security in important situations, whether it’s screening at airports and stadiums or fraud prevention when making payments. But did you know that in Mexico, banks have already been using biometrics in their everyday operations for over a decade? When opening a new account at many Mexican banks today, the first requirement is to scan your thumbprint on a biometric reader. Then, for future transactions, the thumbprint scan serves as a “signature,” verifying the customer’s identity. Typically, the process only takes a few seconds – as fast as entering a PIN number, yet more secure – and the devices themselves can cost $100 or less. Banco Azteca, which has one of the widest coverage areas in Latin America, began rolling out biometric thumbprint readers in 2001, but not necessarily for the reasons you might think. It is not uncommon in Mexico to find people who cannot read or write – sometimes even their own names – and biometrics became a way to allow these traditionally “underbanked” individuals to have bank accounts, usually for the first time in their lives. Over time, the technology has continued to evolve. 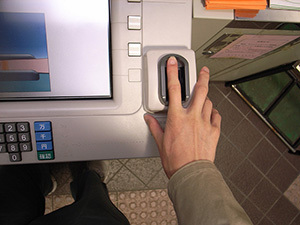 For example, bank officials were initially puzzled, because the fingerprint quality they were getting was often not as good as expected, making it difficult to complete transactions. Eventually, it was discovered that for many customers, such as farmers and laborers, that years of working with their hands had degraded their fingerprints to the point where they were difficult to read. To overcome this challenge, several banks have been exploring the use of costlier, but more reliable, facial recognition and iris scanning technology. In many ways, this stands on its head the usual concept of a security device. Azteca and other Mexican banks are using it to include, rather than exclude, customers by solving a problem for them. At the same time, they are still gaining most of the same security benefits of biometrics. Millions of people have already been helped in Mexico, and with hundreds of millions around the world facing similar situations, biometrics offers a great opportunity for banks willing to make the investment. This is one technology that we hope gains a worldwide following.